Do you live near the South Campus? Do you love to garden? Now is your chance to showcase your love of plants and flowers in the 9th Annual Samuel P. Capen Garden Walk on Saturday July 17th. The Samuel P. Capen Garden Walk began in 2001 with 24 gardens to showcase the neighborhoods surrounding the University at Buffalo South Campus, including University Heights, Buffalo, Eggertsville and Amherst. Samuel P. Capen was the first full-time, salaried Chancellor of the University of Buffalo. Now in its 9th year, the Garden Walk is a free self-guided tour of more than 60 private gardens and carefully nurtured public spaces. The Capen Garden Walk is designed to encourage neighborhood beautification and to build community among neighbors. 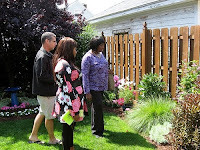 This year, the Samuel P. Capen Garden walk will be a participant in the National Buffalo Garden Festival, a five-week long garden celebration from June 18 – July 25 with tours, workshops, special events, concerts and plant shows all around Western New York. Find out more about this exciting garden festival. To enter your garden visit Garden Walk web page for an entry form. All entries are requested by June 30th. More information about the garden walk can be found here. Your use of this site indicates your agreement to abide by the Terms in effect. Any correspondence with the site, including any documentation or images, are considered property of the site. Univeristy Heights is a private website, and we reserve the right to delete any comments we find offensive. We strive to maintain an atmosphere of free and open conversation, but inevitably, some posts on the site will spiral off into negative sniping and flame wars. When this happens, we reserve the right to close the posts to further comments. If a commenter repeatedly abuses our comment policy, we delete all of their comments on every post on the site, and ban their IP address. Keep all comments relevant to the Site where the comment is being posted. University Heights will not accept responsibility for information posted in the Comments. If University Heights receives notice that a comment post is not in keeping with these terms and conditions or the intended use of the comments, we reserve the right to remove that comment posting. The removal of any comment shall be solely at the discretion of the blog administrators. Please note that once you post a comment to one of our sites, it becomes part of the public conversation. Our policy is that we will not remove a user’s comments unless they are in violation of our Terms of Service, and we won’t remove them otherwise except in very extreme circumstances. The sites routinely contain links to external, third party websites. By providing links to other sites, the site does not guarantee, approve or endorse the information or products available at these sites, nor does a link indicate any association with or endorsement by the linked site to the site . The site does not operate or control and has no responsibility for the information, products and/or services found on any external sites. Nor do such links represent or endorse the accuracy or reliability of any information, products and/or services provided on or through any external sites, including, without limitation, warranties of any kind, either express or implied, warranties of title or non-infringement or implied warranties of merchantability or fitness for a particular purpose. Visitors to this site assume complete responsibility and risk in their use of any external sites. Visitors should direct any concerns regarding any external link to its site administrator or webmaster. The wording of this statement was taken from the folks at WNYMedia.net, who know a lot more about this kind of stuff than we do.